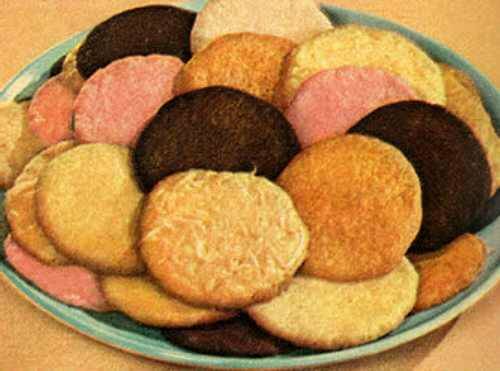 Having a variety of good cookie recipes at hand was the mainstay of farmhouse kitchens back in Grandma's day. A tin of cookies never took long to bake, and they were always appreciated by hungry folk wanting a sweet snack between mealtimes. 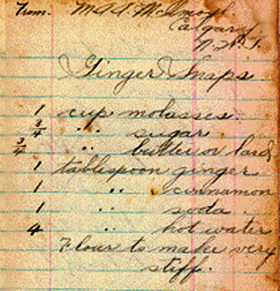 Use the old fashioned recipes below to make a batch of homemade cookies today. Always store your crisper cookies in a container separate from the softer ones; otherwise, they will become soft too. Juice of 2 lemons and grated rind of 1, 1 cup sugar, 1/2 cup butter, 1 egg, 3 teaspoons milk, 1/2 teaspoon soda, 1 teaspoon cream of tartar. Flour to make rather stiff. Bake till done. One cup butter, 1 cup white sugar, 3 teaspoons of baking powder, 2 eggs, 3 cups flour. Cream butter and sugar, add eggs, flour, and baking powder. Roll very thin and bake till light brown. One and one-half cups brown sugar, 1/2 cup butter, 2 eggs, 3 tablespoons milk or hot water, 1/2 pound dates, 2 cups rolled oats, 2 cups flour, 1 level teaspoon baking soda, pinch of salt. Cream butter and sugar, add eggs and milk, dates, rolled oats, and flour with soda and salt. Drop on hot pan and bake in quick oven. 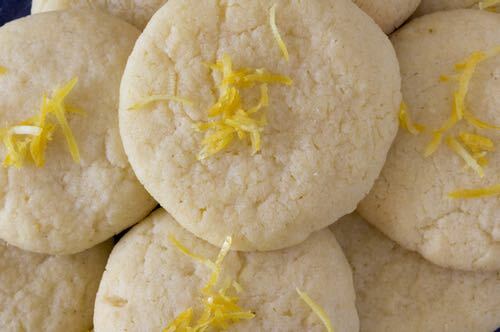 This good cookie recipe calls for one pound butter, 1/2 pound icing sugar, 1 pound flour, 1 egg, 3 teaspoons lemon extract. Cream butter and sugar, add well-beaten egg, flour, and lemon extract. Turn on board, adding enough flour until stiff enough to roll. Cut in shapes and bake in moderate oven until delicate brown. Two eggs, 6 tablespoons flour, 1/4 cup cocoa, 3/4 cup sugar, 1/4 teaspoon salt, 1 cup chopped pecan nuts (or peanuts may be used, if preferred). Beat eggs well. Then beat in sugar and cocoa mixed. Fold in flour and salt sifted, tablespoonful at a time. Add nuts. Drop by teaspoonful on buttered tin, placing a half pecan on top of each. Bake in a moderate oven 15 minutes. Remove from tin immediately after taking from the oven. Two-thirds cup softened butter, 1-1/2 cups sour cream, 2 cups sugar, 1 teaspoon soda, 4 cups flour. Sir butter and sugar together. Add the cream, then the flour in which the salt and soda have been well sifted together. Add more flour if necessary. 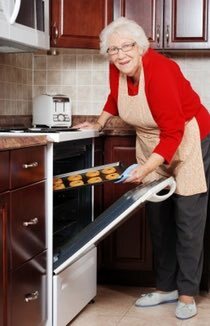 Keep materials all cold while rolling out, and the cookies will require less flour. One cup sugar, 1/2 cup butter, 1 cup water, 2 teaspoons cream of tartar, 1 teaspoon soda, flavor with nutmeg. Flour to stiffen. Mix, roll and bake. Two eggs, 2 cups dark brown sugar, 2 lumps butter size of an egg, 1 cup buttermilk, 1 teaspoon cream of tartar, 1 level teaspoon soda, flour to stiffen, pinch of salt. Don't mix too stiff. Roll out and cut into desired shapes. 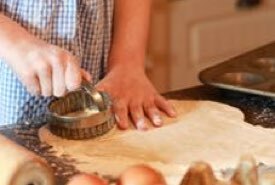 Sprinkle granulated sugar over dough before cutting. Bake in quick oven. For a change, brush with milk, and sprinkle with granulated sugar, or stick a large raisin in the center of each cookie. Mix well 3/4 cup Bisquick®, 1 package instant pudding mix (any flavor), 1/4 cup salad oil, 1 egg. Mix and form into small balls; flatten with hand on non-greased baking sheet. Bake 8 minutes in moderate oven (350°F). The cookies will take on the color of the pudding mix used. Makes about 3 dozen fun-to-eat cookies. These little cookies are simple to make yet colorful and always tasty. Enough flour to roll thin. Roll dough thin, cut, and bake. Remove from oven and while warm, put two together with your favorite jam. Enjoy! Two cups white sugar, 2 cups butter, 4 well-beaten eggs, 5 cups flour, 2 teaspoonfuls soda, 4 teaspoonfuls cream of tartar, 1 teaspoonful salt, flavor to taste with nutmeg or ratafia. Roll not too thin and sprinkle with white sugar. Bake 10 minutes in a quick oven. For a change, press either a raisin or a nutmeat in center of each. A piece of citrus peel could also serve. For this good cookie recipe, cream 1/2 cup butter with 3/4 cup sugar and beat in an egg. Mix or shift together 1-1/2 cups flour, 3/4 teaspoon baking soda, and pinch of salt. Add it to the butter/sugar mixture alternately with 1/3 cup of molasses. Add 1/3 cup of chopped nuts and drop by teaspoonful onto greased cookie sheet. Bake at 350 degrees Fahrenheit for 10 minutes. Into bowl add 1 egg, 1 scant cup white sugar, 1/4 cup molasses, 3/4 cup shortening. Sift in 2 cups bread flour, 2 teaspoons baking soda, 1 teaspoon salt, 1 teaspoon cinnamon, 1 tablespoon ground ginger. Beat until mixed, then shape into balls. Dip in white sugar and flatten. Bake at 350°F until judged to be done. Most kitchens had an old cookie jar on the counter, though sometimes it sat on a high shelf safely out of reach from little cookie snatchers. As busy as she was, Grandma always found time to keep her old cookie jar filled. Ah, the wonderful memories. Why not create memories of your own? Just pick one of the good cookie recipes above and fill your family's cookie jar.